Home / Entertainment / How an abandoned hotel became a witch's house for "Suspiria"
How an abandoned hotel became a witch's house for "Suspiria"
In 1968, the last paying guests of the Grand Hotel Campo dei Fiori with 200 rooms checked out in Varese, Italy. Since then, the property – a once splendid Art Nouveau villa on a hard to reach, wooded alpine foreland – has remained largely empty and reserved only for landlords and their families. The colorfully painted walls are faded and peeled; Parts of the ceiling have collapsed; The furniture, much of which was still there, has accumulated dust. For precisely these reasons, director Luca Guadagnino was determined to shoot Suspiria, a reinterpretation of Dario Argento's horror classic of 1977, on the property. "When we arrived in Italy, we were looking for alternative locations because logistically it would be almost a nightmare," says Inbal Weinberg, the film's production designer. In its heyday, the hotel was "very similar to the Grand Budapest Hotel, if there ever was a real one," she notes. However, when she and her team visited the building, there was no electricity or running water. "But the hotel had so much to offer," she says. So she set about transforming the building into both the main location of the film, a fictional dance school in Berlin in the 1970s, and a functioning production facility. In the simplest words, "Suspiria" follows a young American student named Susie Bannion, played by Dakota Johnson, as she adapts to life in the rigorous, prestigious Markos Dance Academy in Cold War Germany. But nothing about "Suspiria" is easy; The school, as Susie's friend Sara (Mia Goth) soon finds out, is run by witches who perform cruel rituals in secret rooms hidden in the building. While the turbulent energy of the 1970s in Berlin resonates with "Suspiria", the Markos Dance Academy has a strange feeling, says Weinberg. "What we wanted to convey is that the company has existed for generations, like a suspiciously long time," she explains. Accordingly, the living quarters of the witches house furniture from different decades. For the kitchen shown here, Weinberg and Guadagnino looked at early modern interiors. The Frankfurter Küche, one of the first mass-produced fitted kitchens, designed by the Austrian architect Margarete Schütte-Lihotzky in 1926, was an important reference, as was the Haus Sonneveld 1933 in Rotterdam, the Netherlands. While many of the Academy's rooms are large and imposing, "this is the useful part of their world," says Weinberg. "I loved to think about the witch's everyday routines – yes, they are witches, but every morning they go in their robes, they make coffee, they smoke and they eat pretzels and mustard." "Making the dorm was a lot of fun, we decided that the bones of it would be like a 1930s institution," says Weinberg. But she and her team have layered themselves into contemporary details in the form of girls' possessions. "We have developed a backstory for every dancer," she says. "For example, you're obsessed with David Bowie – she even cut her hair and bleached it like his own – we had a lot of Bowie posters in her room." Weinberg's team also researched local Berlin bands from that time and envisioned which clubs Students had visited. "Really underground bands from the seventies gave us permission to use their posters," she continues. "We tried to mix some of the contemporary culture, and even with an alarm clock or phone it banged – things that were very plastic 70s." Charismatic dance teacher Madame Blanc, one of the two characters in the film played by Tilda Swinton, occupies some of the Academy's more opulent spaces. 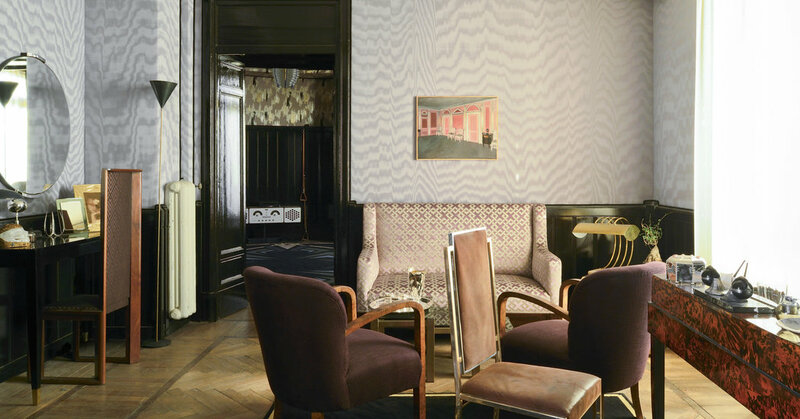 For the black-lacquered dance room adjoining the living room, Weinberg had a rug commissioned by the well-known French carpet manufacturer La Manufacture Cogolin (two more designs by the company appear in other rooms). "We decided early on to have these secret graphic elements for the witches," she says. We used it on billboards and at the door of the dance studio, then I took the claw element and turned it into this kaleidoscopic rug. "The walls are upholstered with a textured silver fabric by the Italian fabric brand Dedar, too Creating textiles that adorned the 17th-century villa in Guadagnino's film "Call" I by your name. "We decided that the academy was in Kreuzberg, in our imagination. It was a neighborhood right on the wall, "says Weinberg," but originally we did not think we would shoot in Berlin, because quite frankly, the city of the 1970s is nowhere near. "Nevertheless, the team traveled to Germany "We had to work very sparingly in the way we did things and put different corners together," says Weinberg, adding decorative elements to these areas as well "We had been doing a lot of visual research on Kreuzberg in the 1970s," says Weinberg, "for example, they fought against the government and the police who were trying to kick many residents out, so many banners were hung from windows. Many of them protested the eviction of squatters. The banner created for this sentence reads: "Busy." Guadagnino and his crew described the hidden underworld of the Academy as "the Motherhouse," or "Motherhouse." Around the ceremonial space in its center, known as the Hall of Feasts, Weinberg and Guadagnino redesigned a loggia at the Grand Hotel Campo dei Fiori by filling its open archways. "We knew we would use these large walls and we tried to find the right structure Weinberg says, "It was Luca's idea to use hair." The team spent weeks weaving hemp fiber threads into plaits to create sculptural, hairy masses, Weinberg adds. We have conceptually decided that the texture of the wall is the hair of the victims. "